What foods when starting solids? 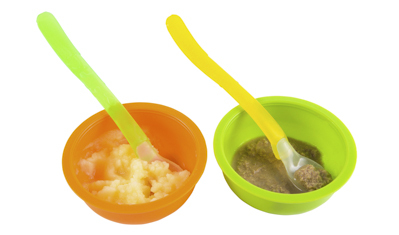 Start with spoon-fed puréed foods when your baby is ready (around 6 months). Move on to mashed and chopped foods over the next few months. Offer finger foods from 7–8 months when your baby is able to pick them up, bring them to their mouth and chew them. Add textures, varieties, flavours and quantities of food as your baby grows. By the time your baby is 12 months old, they’re ready to eat small amounts of many of the same foods as the family. Remember to give your baby iron-rich foods such as iron-fortified baby cereal and/or meat. 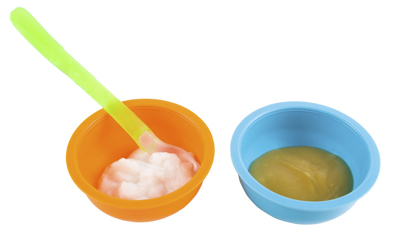 Always prepare, or buy, baby food with no added fat, salt, sugar, honey or other sweeteners. Wait until your baby is at least 12 months old before giving them honey – it can make young babies sick. It’s possible to have a healthy well-nourished infant or child who eats a vegetarian diet if care is taken. What can help prevent allergic reactions to some foods? How to get started giving your baby solids. Questions and answers about healthy eating. Vitamin D helps our bodies use calcium to build and maintain strong bones and teeth. By 6 months, your baby will be starting to run low on the stores of iron they were born with. Iron is especially important to keep blood and brain cells healthy. Food information for babies and toddlers from birth to 2 years old. Current advice on this approach and possible benefits and risks. This page last reviewed 01 June 2013. What food at around 6 months? What food from 7-8 months?